Thailand´s islands (thai=koh) belong to the most beautiful islands worldwide, with nice and clean sandy beaches, coconut palm trees and crystal clear waters. Temperatures are between 28 and 35 degrees Celsius with a soft cooling breeze from the sea. Especially at night, life takes often place on the beaches with seafood and thaifood dinners, feet in the sand and music with fireshows in front of the sea. It´s a romantic and tropical experience, you´ll not forget. Most flights to Thailand arrive at Bangkok Suvarnabhumi airport oder Don Mueang airport. Traveling from Bangkok to the islands in the south and in the east can be done easily by flight or bus. Most local flights with low cost airlines (Airasia, Nokair, LionairThai) start from Don Mueang airport to Krabi, Hat Yai, Suratthani, Trang or Phuket. Bangkokair flies from Suvarnabhumi to Samui, Phuket or Trat. Flight tickets can be bought online. Most of the islands are connected by speed boats, express boats or catamarans. Schedule is limited during the rainy season from May to October/November. Boat tickets can be bought at any pier or jetty. Airasia and Nokair offer combi tickets for flight, bus and boat, e.g. to Koh Lipe or Koh Lanta or Koh Phangan. Healthy coral gardens and a huge variety of fishes provide a paradise for divers and snorkelers. The water temperature is around 25-29 degrees Celsius and underwater visibility is up to 40 meters. Traveling in Thailand and finding a bungalow or hotel is still easy and cheap. From simple huts for 800 Baht per night, nice bungalows for 1.000-3.000 Baht or luxury pool villas up to 20.000 Baht with full service, privacy and spas in tropical gardens, everybody can find his or her own individual paradise or hideaway at the beach. Find your holiday home right here on this website. Traveling by bus or boat is easy too and very cheap. And if you want to fly, a choice of low cost airlines provides a frequent flight schedule to all parts of Thailand. 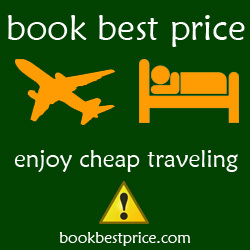 Flights can be booked easily online. I invite you to gather informations about Thailand´s islands on this website, use the links for flight bookings and especially for hotel bookings (safe money and time). It´s easy, simple and safe. I provide recommendations for the most beautiful, best located or luxury hotel resorts in Thailand, an ideal place for honeymooners or people, who want to spend time in paradise for some days. Enjoy your planning, keep on dreaming!